As posted on Glori Gage's, website. Many of us support organizations that help others. This is one special organization that has touched my life....an organization that is making a difference to children all over the world. Click graphic to go to Glori's website. 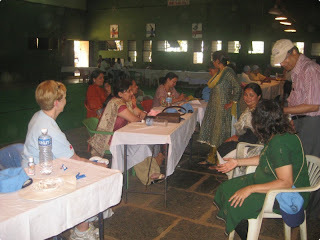 Photos are available in the Pune 2011 Photo Album. You can view them by clicking the link above. Photos are available in the Belgaum 2011 Photo Album. You can view them by clicking the link above. Photos are available in the Chennai 2011 Photo Album. You can view them by clicking the link above. March is Nutrition Month! Several activities are planned to raise student awareness about healthy eating. Students are encouraged to bring at least three fruits or vegetables to school each day; every classroom will make posters promoting nutritious food choices; students will be submitting recipes from which a healthy cookbook will be created; and many games and activities are planned. A babysitting training course will start this week for interested Grade 6 students. 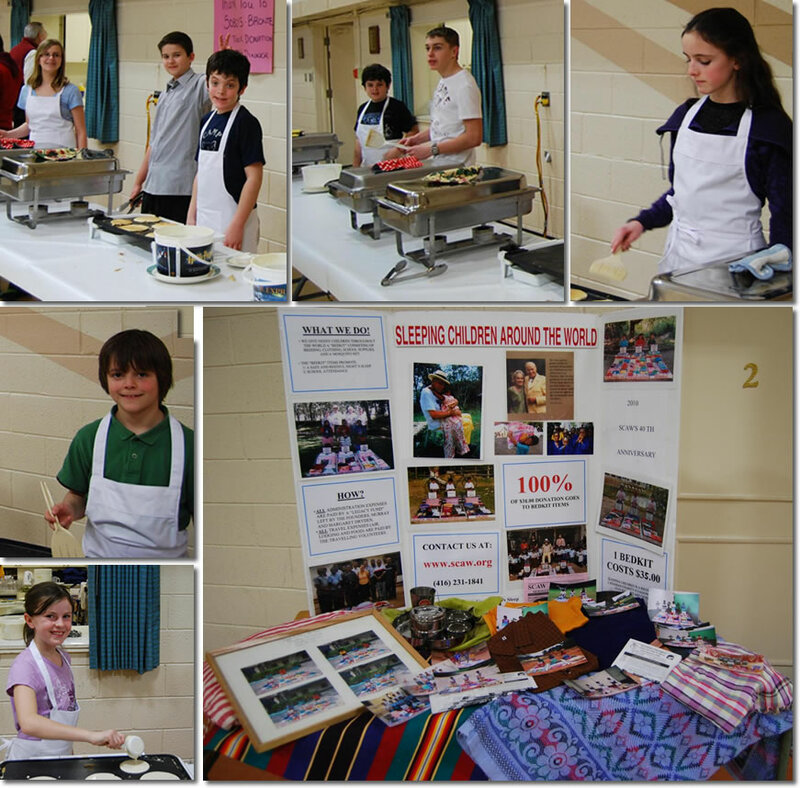 In February, the school held a dress-down day to raise money for Sleeping Children Around the World. This organization provides bedkits for children in Third World countries. Thanks to the students of Sunshine Academy, $420 was raised, providing 12 needy children with a kit, which includes a mattress, bedding, pillow, mosquito net, sandals and toiletries. Thank you! As published on YouTube, March 20, 2011. I spoke to her to learn more about how valuable SCAW's bedkits were to an underprivileged child living in her community. SUNDAY, MARCH 27 Chili Cook Off, 5-7 pm at Palgrave United Church (34 Pine Ave). Enter your best chili recipe or come and sample others, followed by presentation of Honduras tour by Sleeping Children around the World. Free will donation. Everyone welcome. As posted on the Argus Press website, Owosso, Michigan -- March 17, 2011. OWOSSO — Seventy members of area Aktion Clubs combined having fun with helping a good cause at Capitol Bowl on Wednesday. The bowlers, developmentally disabled adults from clubs in Owosso, Mason, Holt, St. Johns and Bergmann Center, each paid $15 for lunch and two games, with $7 going to the Sleeping Children Around the World organization to provide bed kits to homeless children. Jon Vargas, 22, of Stockbridge couldn’t keep the grin off his face as he got ready to knock down some pins. Aktion Clubs, sponsored by Kiwanis International, are designed to open doors for people of all abilities. Elsie Humes, 46, lives in a group home in Mason, and works at a greenhouse three days a week. She has attended the annual Aktion Club Bowl-A-Thon from its inception three years ago. Last year, the Bowl-A-Thon raised enough funds to provide 24 bed kits, said Sue Stone of the Shiawassee County Community Mental Health Authority. Stone, an Aktion Club volunteer, organized the event. “It’s a fun day for all the Aktion Clubs in Shiawassee County to get together, meet each other and raise funds for a worthwhile organization,” she said. Gordon Schleicher, administrator of Aktion Clubs in the Lower Peninsula, drove from Mason to support the project. “The best part of coming here is seeing these folks smile,” said Schleicher, member of the Golden K’s, a Kiwanis club in Mason. Ian Bennett, a first-time attendee, broke into a big smile after landing strikes in his first two frames. The 31-year-old boasts a 150-point average on a bowling league in Mason, but said he was only bowling for fun Wednesday. Linda Mason of Owosso came to watch her son, Robert Mason, 37, socialize with friends and bowl. Mason said she enjoys attending Aktion Club events. Many club members live independently, such as Kim Cole, 42, of Owosso, who shares an apartment with a friend and does volunteer work. On Wednesday, she was making new friends at the Bowl-A-Thon. “I’m trying to get to know people in the other clubs,” she said. Aktion Clubs in Shiawassee County undertake many community service projects. For example, the Owosso Aktion Club has raised money to build wheelchair ramps, and donated $10,000 to Kids Against Hunger, thanks to proceeds from a recycling truck parked at VG’s grocery store, Stone said. As posted on SNAP Perth, Community Events in Perth County. Location: Immaculate Conception Church, 50 Well St., Stratford, ON. Beginning on Ash Wednesday, March 9th, until April 13th there will be lenten lunches held from noon till 1 pm at Immaculate Conception Church. There will be different Speakers every day and lunch is available at $7 per person. April 13th- Paul Kowtecky- Ontario St. Baptist. As posted on Vagabondish, the Travelzine for Today's Vagabond. 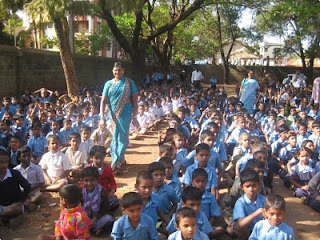 Our eighth and final distribution was located approximately two hours south of Hubli in a town called Yellapur. It is known for its two beautiful and natural waterfalls – Magod falls and Satoddi falls. The distribution took place inside of an Ashram. It was beautiful. 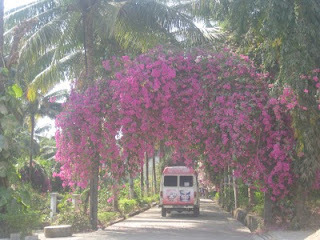 The grounds were filled with rings of rich purple flowers, tall white historic buildings and old cobblestone paths. We all knew right away this was going to be a great place to deliver the last of our bedkits. Spiritual leaders greeted us with flowers and a religious offering, took us inside one of the buildings where the meditation took place, and told us more about what went on inside of an Ashram. In essence, it’s similar to what Julia Roberts visited in Eat, Pray, Love – a beautiful and spiritual haven where people from all over the world gather to be with their thoughts for days, even months. Following the information session, we were led to the distribution site. All 100 kids were lined up to get changed into their new clothes and receive their bedkit. 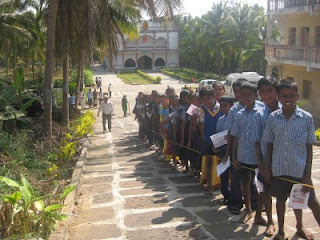 Once all the kids were changed, they lined up in order and in the shade as they waited to get their picture taken. My duty of the day was interviews, which I was pretty excited about because it gave me a chance to interact with the parents again. One of the Rotarian wives, who also owns a copper piping factory with her husband, was acting as my translator. Right away, I knew I was going to like this woman. She was extremely organized, eager to help and a strong woman. The first question I asked her was “where were all the parents”? Typically, we see hundreds of parents waiting outside to greet their children after receiving their bedkit. However this time around, I only noticed about 30 women around the grounds. This was because the majority of children receiving a bedkit lived one to two hours away from the Ashram and rather than the parents missing a day of work, they organized a bus to transport the children to and from the distribution site. Even more, the Rotarians fed the children a nice large breakfast when they arrived, followed by snack while waiting for their picture, and then ending off with lunch post distribution. Mind you, the distribution was 100 children, quite less than some of our other distributions on this trip, but regardless my team and I loved all the kind gestures, going one step further towards making sure the children had a special day and were truly cared about. It was me, the translator (her name is Rajani), and approximately twenty mothers from very different yet similar living arrangements. Although most seem to still be married and have zero health problems in their family, we did meet a few mothers who were struggling just a little more. One woman lost her husband to stomach problems and another to diabetes. Two mothers had children who were sick – both children fell quite hard at one point and hurt their arms, which never fully healed. I met this one woman who was taking care of not only her children, but her sister’s children as well – their parents both died not too long ago (their father died of alcohol poisoning four years ago and their mother died two years later as a result of stress). I had a chance to meet the children later that day and although both were very shy, they seemed like happy children thankful to their aunt for looking after them. We also met one eight year old boy who was a burn victim. Boiled water accidentally fell on top of him and now his entire face (and part of his body) is covered with burn scars. Despite the local Rotarians taking him under their wing and paying for his medical expenses, his burn scars are quite severe. Not only did the incident leave a mark on the outside, but also on the inside. I noticed throughout the whole distribution, the little boy kept to himself. No kid approached him and he didn’t approach them back. Luckily Tom, our resident surgeon on the team, had a chance to learn more about the case and has offered to investigate the potential of performing a surgery on the child here in Canada that would close to eliminate all of the boy’s scars. We left the last distribution site feeling the same way we felt leaving every other distribution site: on a natural high after being surrounded by so many beautiful children and parents. But it was also a little bitter sweet, given that it was our last distribution and we were about to go home, back to our everyday lives. Part of me wanted to keep on going, join another distribution team and continue to hand out bedkits. I’m not gonna lie, part of me was pretty tired – waking up at 6:00 a.m., getting back to the hotel and 8 or 9:00 p.m., and sitting on the bus for hours on end each day and spending whatever free time I had, writing. But I wouldn’t have traded this for the world. As we prepared for the end of our trip, I know I speak for the majority of the team when I talk about the mixed emotions we had throughout these past two weeks – there were the happy times when the children laughed as they were getting ready to get their picture taken or participating in one of many many games we played with them (mostly they were laughing at us for acting so crazy, which we were totally fine with). Then there were the sad times, listening to the stories from parents, seeing a 12 year old boy maneuver himself in a clunky old homemade wheel chair with no legs, refusing any help and getting himself up to the area for his picture. One thing is for sure, no matter how each of the distribution trips made us feel, we left the trip a better person, thankful we were able to share these moments with each other and with the children. I know this may sound like a bit of a cliché, but I hope I’ve sparked a little something in each one of you reading my blog, and whether or not its a SCAW distribution or some other travel adventure you’ve always wanted to do, life’s too short to just wait for these moments to come to you. Grab them now while you have the chance! As published in the Stratford Beacon Herald: Monday, March 14, 2011. Shy ones. Silly ones. Thoughtful ones. Proud ones. There are young ones with smooth, unblemished skin, and older ones with wrinkles etched deeply into their weather-worn foreheads. Almost all of them are smiling, with big, expressive eyes. They look genuinely happy, despite the poverty that surrounds them every day. Sue Orr captured hundreds of faces with her camera during a recent two-week mission to India with Sleeping Children Around the World, and that’s one of the things that stood out the most for her. “They’re such vibrant people, and very, very gracious,” said Orr, who was part of a seven-member team that helped distribute 4,000 donated bedkits to children in some of the poorest regions in and around Belgaum, in southwestern India last month. The $35 kits, which include things like a sleeping mat, blanket, clothing, mosquito net, school supplies, and a metal plate, cup and bowl, are delivered by volunteers in underdeveloped and developing nations like India, Africa, Nicaragua and the Philippines to fulfil one simple goal — to give needy children the opportunity for a good night’s sleep. A simple goal, but a worthwhile one, said Orr, who has participated in three excursions with Sleeping Children Around the World now. The first was in Kenya in 2007, and then in Bangladesh in 2009. Each trip convinces her of the importance of reaching out to the world’s most underprivileged. At each of the nine locations where the bedkits were distributed, hundreds of eager children and their parents lined up, many walking long distances to do so. They were happy, excited and overwhelmingly grateful to receive the modest gift, said Orr. Some even kneeled and kissed her feet, which at first made her uncomfortable until the team’s translator explained that it was their way of saying thank you. “Some days it would just bring me to tears,” she said of the experience. Helping those who have very little — some of the people she met worked for 70 cents a day — was “very humbling,” and gave her an important sense of perspective that many people in prosperous countries like Canada seem to lack, said Orr. The hundreds of photos Orr took on the excursion — what she calls Faces of India — illustrate that spirit, and it’s something she keen on sharing. In fact, it part of the Sleeping Children Around the World model. A photo is taken of each child who receives a kit, with a card showing the donor’s name and sometimes a personal message. Those photos are then sent back to the donors to show how their $35 contribution has made a difference. 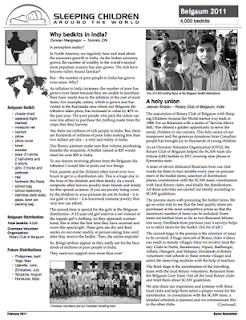 The organization’s website also features a blog with regular updates on the bedkit distributions written by the volunteers themselves. And Orr chronicled the trip, with comments and photos, on her own Facebook page. 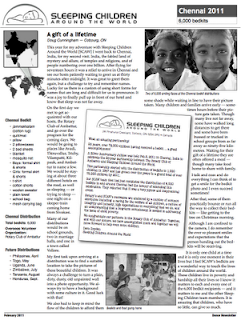 More information about Sleeping Children Around the World can be found at www.scaw.org. Submitted by SCAW Volunteer, Laura Harper. The children of St. Paul's United Church's Sunday School in Oakville hosted a pancake supper on Shrove Tuesday to raise funds for Sleeping Children Around the World, raising enough money for 24 bedkits. The Sunday School superintendant, Sharon Holmes, as a Grade 13 graduate, had travelled as a SCAW volunteer and for the past eight years has promoted this fund raising event. Click photo to see it larger. As posted on the you.is Network A weekly dose of global causes, March 13, 2011. No portion of a bedkit donation is spent on administration — 100% reaches a needy child. Each $35 donation (Canadian funds) provides a bedkit that consists of a mat or mattress, pillow, sheet, blanket, mosquito net (if applicable), clothes outfit, towel and school supplies. Bedkit contents vary from country to country depending upon local needs. 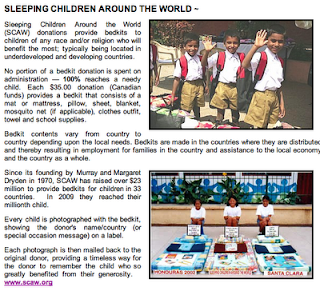 Since its founding by Murray and Margaret Dryden in 1970, SCAW has raised over $20 million to provide bedkits for over 800,000 children in 33 countries. As posted on the Anglican Diocese of Toronto website. Kids Helping Kids is looking for more ideas. We would like to include ideas, programs and events that will help children learn about, understand and help those in need. It will focus on people who need support within our congregations, communities, country and around the world. This page's goal will be to assist parishes in supporting our children in their growth to becoming good stewards of God’s resources both at home and abroad. Bishop Johnson has outlined his vision for our Diocese focusing on a need for us to be advocates in the fight against child poverty. A child's sense of compassion, understanding and honesty can be wonderful gifts when advocating for children in need. Umtha Welanga - Get your Sunday School on board and support nurse Rachel Johnson. Nurse Rachel is helping children in South Africa who are HIV/AIDS positive. She is opening an AIDS treatment centre called Umtha Welanga or "Ray of Sun" through Keiskamma Trust (www.keiskamma.org ). South Africa does not have a health care system like Canada's so it costs each patient a large amount of money to stay. However, through donations and sound planning, the average cost for each patient in 2007 is $300. This amount provides full care, food and medications. Please email Laura at the Diocesan office kids@toronto.anglican.ca if your Children's Ministry program would like to support this worthwhile cause and help other children around the world. A peaceful night's sleep is something every child should take for granted. But for many children in the developing world this isn't the case. That's where Sleeping Children Around the World comes in, they aim to change that. As the recipient of The Raymond James Ltd. Annual Holiday Card donation last year, now we too, are a part of that change. 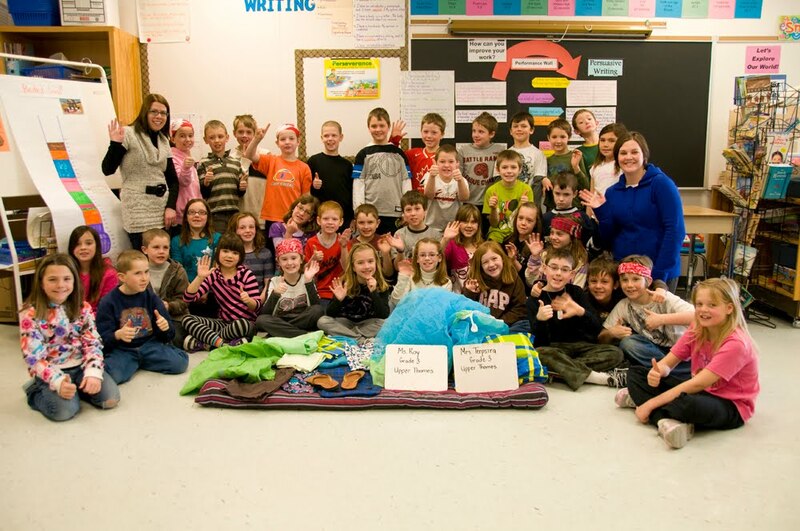 The Canadian-based charity provides bed kits to needy children in developing countries. Each kit is made up of necessities such as a mattress, pillow, sheets, blanket, mosquito net and clothes. Basics items that mean so much to a child in need. Sleeping Children Around the World is not only supported by Raymond James Ltd. but on a more personal level by our Vancouver-based Financial Advisor, Warren Wagstaff. For almost 20 years Warren has supported SCAW by making Christmas donations on his clients' behalf. Last month Warren travelled to Kolkata, India to continue his work as a volunteer. "This was my fifth trip as a SCAW ambassador, this time I was travelling as a team leader which entailed a new level of responsibility." In Kolkata, Warren helped distribute 6,500 kits containing 19 items intended to provide each child with a safe and peaceful night's sleep. "Receiving the $10,000 donation from Raymond James was great, I was able to explain to the children who we were and why we gave the bed kits, it was a wonderful way to connect with the children," says Warren. "The city left a lasting impression on me. The people were open, warm and friendly - willing to share their culture and hospitality with us." Our school board sets out a Character Attribute initiative each month. During the month of January, our students were to learn about responsibility. Within our Grade 3 classes, we decided to extend this learning, and make it a hands on experience. As we taught our students about the importance of being socially responsible, we developed the idea of donating bedkits to Sleeping Children Around the World. We learned about this wonderful organization through Laura’s family. Each year, her Grandparents donate bedkits for Christmas presents for their family. Her Uncle has travelled to Bangladesh twice now to distribute thousands of bedkits, and has learned firsthand how far each dollar goes. Our goal was to create an eagerness in our children to help less fortunate children, and show them how truly fortunate they are to have the life they have. 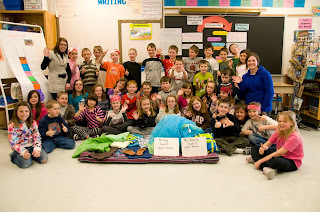 Our goal in each classroom was to raise enough money to donate 5 bedkits each. Instead of just asking their parents for the money, we decided that our students would complete chores for their family and earn this money. This would further their learning about being responsible children. The generosity of our students was overwhelming as they willingly shovelled snow, took care of younger siblings, and helped clean up after supper. Their focus remained strong as they understood that each dollar raised was going to help another child have a good sleep. are no different than each of our students. They are children, and all they want is to play, laugh, and be safe. Our students (Pictured above. Click to see larger image.) made us so proud when our total between our two classes was $700. We were able to buy 20 bedkits! As teachers, the most rewarding experience came when our students truly understood what it means when people say that it is better to give than receive. Our students are thrilled with their accomplishment. Because this was such an amazing experience, we look forward to doing it again next year with our classes. 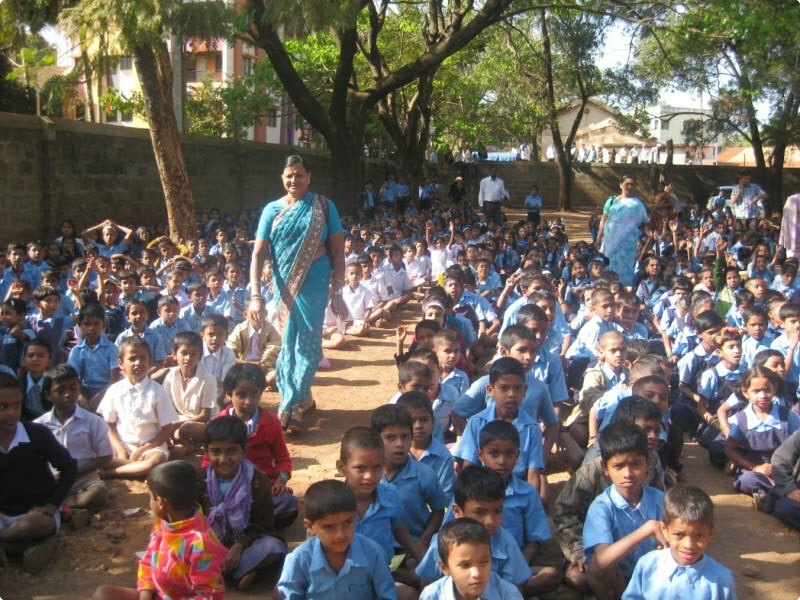 Our largest distribution took place in the city of Belgaum, population of approximately one million people. We handed out 1,000 bedkits that day and believe me, it wasn’t easy organizing 1,000 children and their parents, but it was done and done smoothly, thanks to the local Rotarians and their families. The Rotarians are some of the most well-respected men in town. They are factory owners, they are doctors, they are IT developers and they are engineers. Their wives are just as educated. I spoke to one woman, Sonal Dhamankar, who is an obstetrician. She and her husband each own their own private practice in Belgaum and they have one daughter. She explained the three kinds of medical facilities in India to me. First there was private, which is the best that medicine in India has to offer, however it is quite expensive. Then there is public, where although it is free, you are almost guaranteed not to see a doctor. For instance, one doctor may be on staff at any given time however there are hundreds of people coming through the hospital at once. How is it physically possible to tend to all these people? Well, the doctor doesn’t, leaving the majority of patients to be cared for by the nurses and other staff instead. Lastly, there is what Sonal refers to as the “quaks” – medicine doctors if you’d like to call them, providing locals with herbal and sometimes illegal treatments for spiritual reasons or because they can’t afford to see or get to anyone more qualified. I asked her about population control as there are so many people living in India and so many of the people are poor. Why are poor families having so many kids if they can’t afford to properly take care of them? Today, the average lower income class family has three to four children. If they had any less, it would be looked down upon by the rest of the community. Wives whose husbands belong to the Rotary Club of Belgaum. These Rotarians have been our main contact in planning and preparing for this two week distribution. However, if you asked this question five or ten years ago, the number of children per household would be much greater, so slowly but surely the number is going down to a more manageable number of children. In addition, birth control is free in India, but it is the sole responsibility for the female to protect themselves. The men aren’t required to do anything. The only problem is no one teaches these women how to use protection so things tend to fall through the cracks. I also had a chance to talk to some of the children of the Rotarian families, specifically 13-year olds Revati, Nikita and Ashana. Each one of these girls are the kindest, friendliest and curious bunch of girls I’ve ever met. We took turns asking each other questions about our life and what it was like to grow up in the different countries. Each one of the girls value the connection they have with their families, spoke perfect English, and had read and seen all the Twilight series films/books. Nikita plays guitar, Ashana is into fashion, and Revati is a badminton player. They are still a bit too young to think about college, but they all want to go and grow up to be Engineers or Interior Designers. We connected on Facebook that night so we could keep in touch. One of my favourite things about traveling is learning about the people. If I had a choice of whether or not to visit a local museum or have tea with a person currently living in the community, I wouldn’t think twice about skipping the museum. Each one of the people I met in Belgaum gave me such a wonderful perspective of what it is like to live in a city not as large like Mumbai but not as small as Ashanti. I thank them all for taking the time and giving me a small glimpse of what it is like in their world – and a special thank you to one woman for making sure I was taken care of and fed after a little mishap that morning. Our third distribution was in a town called Harugari, approximately three hours from Belgaum, where we distributed 150 bedkits. We had such a great time at that site — we’d high-five the kids as they ran across the room to change into their new clothes. It was also the only distribution where all the parents and kids stayed until the very last bedkit was handed out to thank us and say goodbye. There was one girl in particular that stuck out in my mind that day. Her name is Veena Benti. 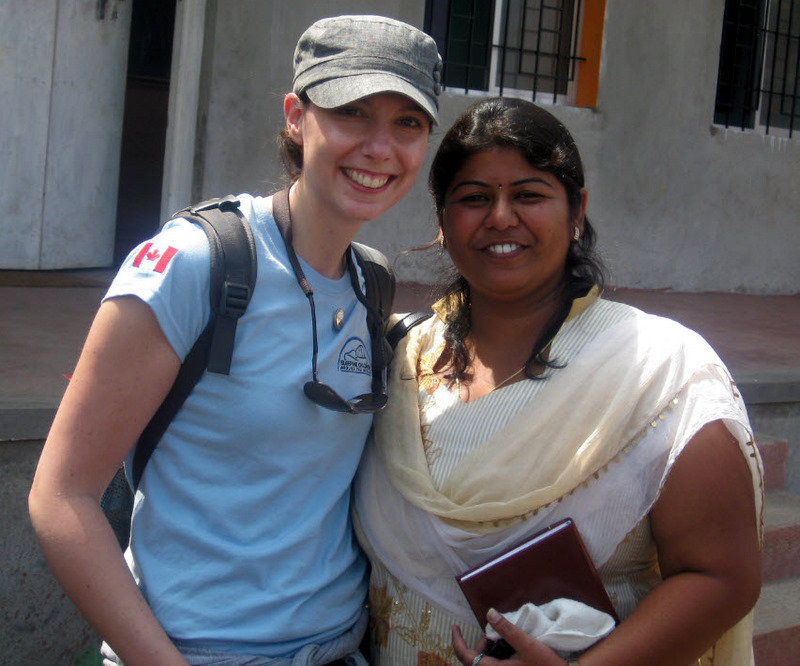 (Pictured at right with Tamara at the SCAW distribution site in Harugari, India. Photo by Tamara Kaftalovich) She’s 22 years old and originally from the town of Harugari, but is now going to college in Bangalore, working toward a degreein business administration. Veena comes from a privileged family. Although she grew up in a very small town, her father was a prominent politician. Veena’s father has since passed away, but her mother still lives in this town. She also has two sisters who are married and live elsewhere. More often than not, the children receiving a bedkit do not go off to college. Instead, at the age of 16 or 17 they graduate from public school, which is paid for by the government (the families only need to provide school supplies), and they go to work to help support their families. Veena’s former principal invited her to attend our distribution at a local school so she could witness first-hand what it was like to execute an event like this and learn more about what we do, so she could apply it to her studies and later, her work. Once she graduates, she wants to work abroad and receive hands-on experience in social work so she can later use that experience toward helping the needy people in her home community of Harugari. Her optimism, selflessness and kind-hearted nature are what I remember most about her. She’s appreciative of where she came from — her family, her people, her home — and despite her privileged upbringing and getting the opportunity to study and work abroad, she is still choosing to eventually return home to help her community. At the end of the visit, and before we said goodbye, she took off one of her rings to give to me as a sign of friendship. I was so honoured. I gave her one of my bracelets in return. I look forward to keeping in touch with her and learning about all the wonderful things she does in this world.